(Real Gone Music) 24 tracks with color booklet. RCA’s Living Stereo imprint made quite the cottage industry out of releasing Christmas albums in the late ‘50s/early ‘60s, and indeed we at Real Gone Music have taken great pleasure and pride in releasing a lot of them on CD. 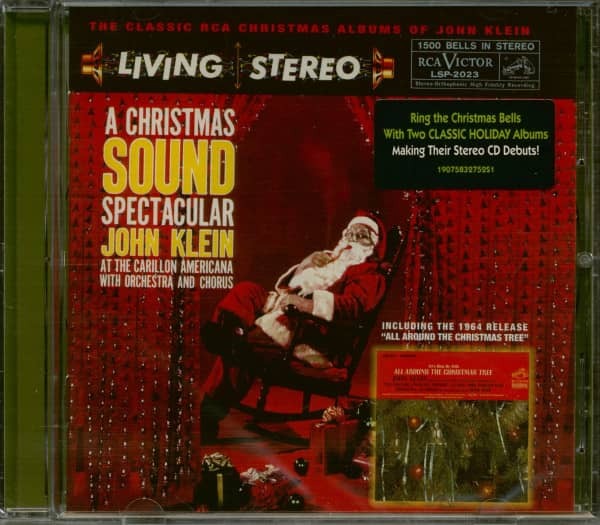 But of all the Living Stereo Christmas records, the one that is perhaps the most distinctive—and one that remains close to many people’s hearts—is the 1959 album by musical Renaissance man John Klein, A Christmas Sound Spectacular. Trained by Igor Stravinsky and Nadia Boulanger (teacher to both Aaron Copland and Quincy Jones! ), Klein brought his formidable talent and skill on this album to the most imposing instrument in the world: the Carillon Americana, the largest of its kind, consisting of 1500 bronze caste bells ringing in perfect tonal quality. In fact, the Carillon Americana was so large that RCA Victor brought all of their recording equipment to the instrument’s home at the Schulmerich Bells’ offices in Sellersville, PA. instead of trying to move it to New York! The sound of the bells, beautifully meshed with Klein’s Billy May-inspired arrangements for accompanying orchestra, resulted in a record so unique that RCA offered a money-back guarantee to any customer who didn’t agree that it was “the most spectacular sound on records.” One suspects they got very few takers; however, this one-of-a-kind holiday classic has never been out on CD except for a small private pressing of the mono version; this marks the stereo CD debut of A Christmas Sound Spectacular, and, trust us, you’re gonna want to hear this in stereo! 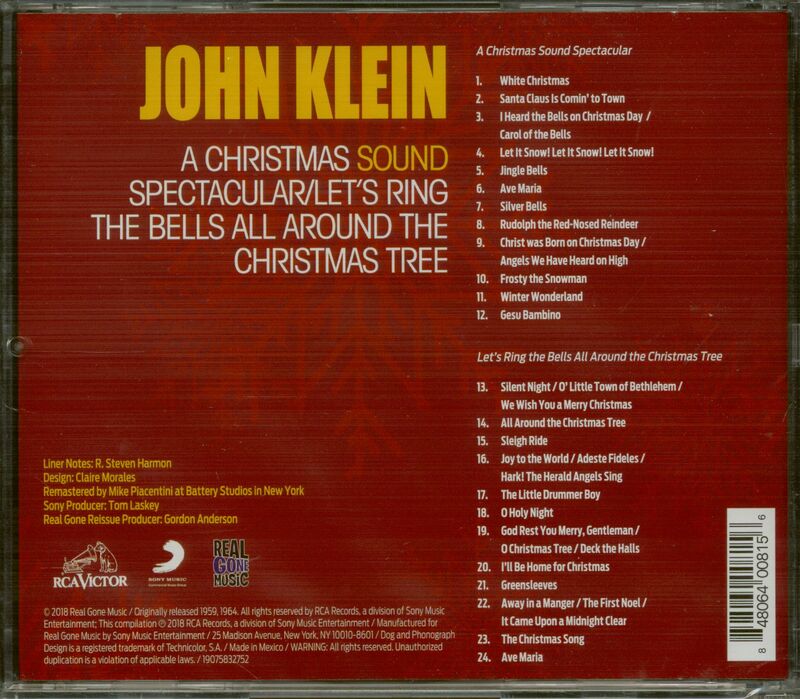 We’ve paired it with Klein’s other “bells” record, Let’s Ring the Bells All Around the Christmas Tree, which was recorded at the 1964 World’s Fair in New York with a Carillon specially built for the occasion, with arrangements by Henri Renè, who had already won his Christmas bona-fides by scoring Eartha Kitt’s unforgettable “Santa Baby”…another CD debut, also in stereo! Liner notes are by R. Steve Harmon, whose father James Harmon, President and Program Director at the mighty 690 in San Diego, chose to bring A Christmas Sound Spectacular home to play for the family out of all the thousands of Christmas records the radio station received. Remastered by Mike Piacentini at Battery Studios in New York...Christmas bells will be ringing once again this holiday season with this release! 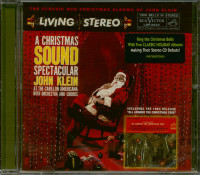 Customer evaluation for "A Christmas Sound Spectacular - Let's Ring The Bells Around The Christmas Tree (CD)"